Motorists who typically travel Elm Avenue and south 4th Street to access Oak Creek Grade Road will encounter detours this week. Crews with the Fremont County Department of Transportation will be paving County Road 143—Oak Creek Grade Road from Tuesday, June 7th through Thursday, June 9th. During these asphalt paving operations motorists are being asked to detour to 1st Street in Cañon City. County crews will be paving Oak Creek Grade Road from Elm Avenue south to Shadow Hills. A portion of Forge Road under county maintenance will also be paved as part of this project. The names of another 74 veterans have been engraved on the wall at the War Memorial Park at the Fremont County Airport with preparations underway to dedicate those names in a ceremony over the Independence Day weekend. The engravings were completed just before the end of May and concluded what was a wait for some veterans and their families that extended for more than two years. Fremont County Veterans Service Officer Al Augustine said the initial wait for some veterans came because the county needed a minimum of 50 names to place an engraving order with a vendor from Denver. Once that minimum order was reached at the close of 2014 the engraving order was placed. From spring through the fall of 2015 the vendor repeatedly encountered scheduling problems that were complicated by wet or windy weather. Fremont County Commission Chairman Ed Norden said when it became obvious that the engraving would not be completed by the onset of winter, the Board of County Commissioners and the vendor in Denver mutually agreed to part ways. Arrangements were then made with Rocky Mountain Memorials in Colorado Springs to do the engraving at the earliest good weather opportunity this spring. Norden said the commissioners apologize to all the veterans and their families for the delay, adding that county officials were equally as frustrated throughout the process. Augustine is now making arrangements to dedicate the newly added names to the War Memorial Wall at a ceremony scheduled for 10 a.m. on Saturday, July 2nd. Details about the ceremony will be announced in the coming weeks. 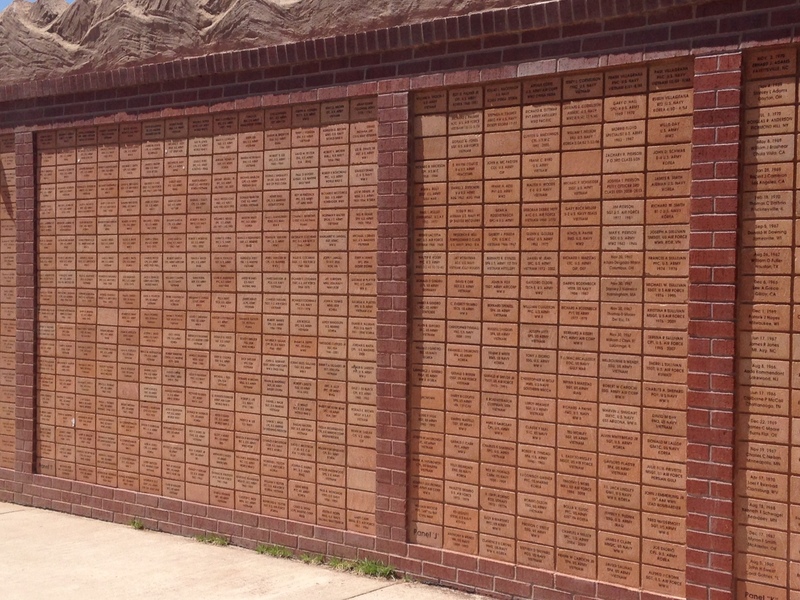 Commissioner Norden said because the wall is quickly filling with names of veterans more work is planned this summer to make more bricks available. Norden said Panel A on the War Memorial Wall was originally intended for the listing of donors. He said brick work will be undertaken to list all donor bricks on the left side of Panel A and thus create another panel of blanks to engrave the names of more veterans. Veterans or families interested in engraving a veteran’s name on the wall should contact Augustine at the Fremont County Veterans Service Office in the County Administration Building. There is a $50 cost for the engraving of each brick. Bank financing to complete a $5 million renovation project in the kitchen and laundry facilities at the Fremont County Jail is now in place. The Fremont County Board of Commissioners approved a resolution at a special meeting on June 1st arranging for bank financing of the project through Branch Banking and Trust Company which has agreed to purchase the certificates. Renovation of the jail’s kitchen and laundry areas were listed as some of the key capital improvements needed when Fremont County voters approved a one cent sales tax increase two years ago for the Sheriff’s Department. Although Sheriff Jim Beicker has worked to accumulate cash reserves in his budget to pay for part of the project, the Board of Commissioners and the Sheriff agreed that some short term financing would be necessary to complete the renovation. The Sheriff is also using a portion of the capital reserves from the sales tax to replace his aging fleet of patrol vehicles. The resolution approved by the Board of Commissioners calls for the project to be paid off over a seven year period by 2023. The payments will not exceed $800,000 a year from the Sheriff’s budget with an interest rate not to exceed three percent. Fremont County Manager Sunny Bryant said it was important that the renovation project be paid off prior to the ten year sunset of the sales tax. With financing now in place work can proceed to prepare documents to seek public bids later this summer to get the project underway. Bryant said the lease-purchase bank financing means there will be no general obligation debt incurred by the county. 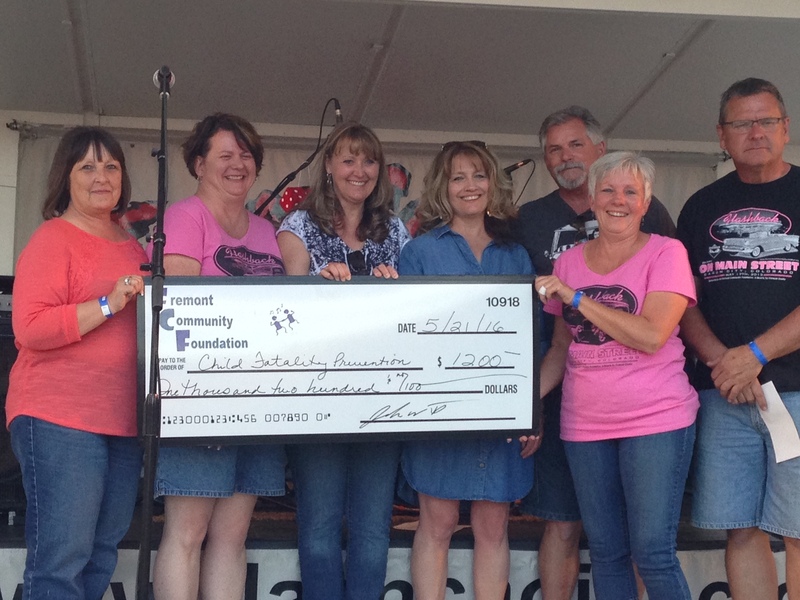 The Child Fatality Prevention Team under the auspices of Fremont County Public Health was the beneficiary of $1,200 awarded by the Fremont Community Foundation at the May 21st Flashback on Main. Pictured (left to right): Kathy Toothaker & Autumn Dever,FCF Board Members; Lori Steinbeck of Fremont County Public Health; Stacey Kwitek of Fremont County Department of Human Services; and Dan Brown, Pam Marietta, & John Marietta, Fremont Community Foundation Board members. Volunteers in Fremont County who took up the Governor’s challenge to focus on ending homelessness for veterans in Colorado were in Denver Wednesday to be honored for their efforts by Governor John Hickenlooper. Fremont County was one of five counties in Colorado that was selected to participate in the 100 Day Challenge to House Veterans Experiencing Homelessness. The 100 Day Challenge was created by the Office of Governor John Hickenlooper and the Department of Human Services’ Office of Behavioral Health as part of the ongoing State and National effort to make Veteran Homelessness rare, brief, and non-recurring. Loaves and Fishes Executive Director Dee Dee Clemont, Upper Arkansas Area Council of Governments (UAACOG) Regional Housing Director Autumn Dever, Jim Berg of the Fremont County Department of Human Services, and Cañon City businessman Brad Rowland, who is interested in transitional housing, are among the volunteers who have spearheaded the 100 Day Challenge in Fremont County. 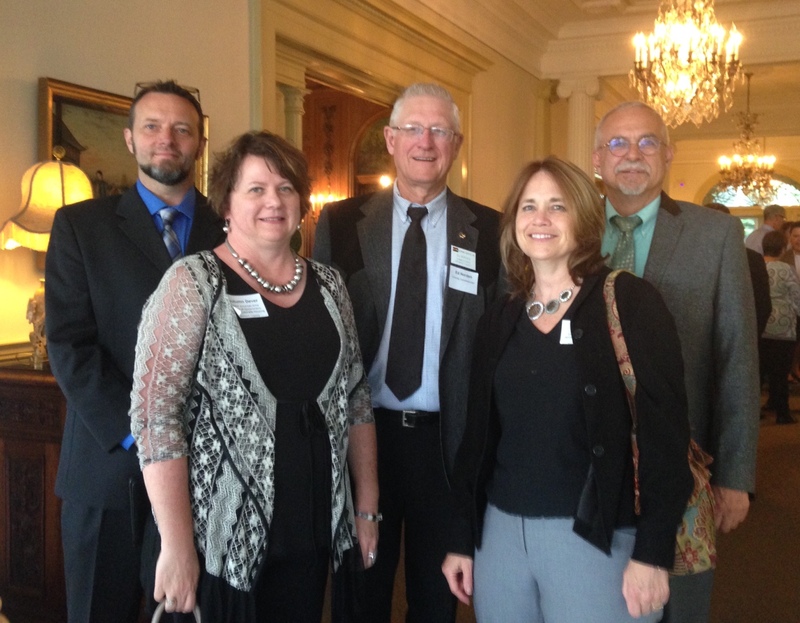 They were joined at Wednesday’s reception at the Governor’s Mansion in Denver by Fremont County Commission Chairman Ed Norden. Governor Hickenlooper told those gathered at the reception that 171 homeless veterans in Colorado have been housed so far in 2016. The Governor said the goal is to house over 500 homeless vets before the year is out. The Governor said “When we get to functional zero for homeless vets then we can focus on ending homelessness for all in Colorado”. When the volunteers of Fremont County took up the 100 day challenge early this spring it was estimated that there are 23 homeless veterans in Fremont County. Key to the effort in Fremont County is pursuit of a 30 unit housing project along Justice Center Road in Cañon City that would target the homeless population in Fremont County. The UAACOG is in the process of working with the Colorado Housing and Finance Authority to get the financing in place for the project. Others interested in volunteering to work towards ending homelessness for veterans in Fremont County can contact Autumn Dever at the UAACOG Office in Cañon City. 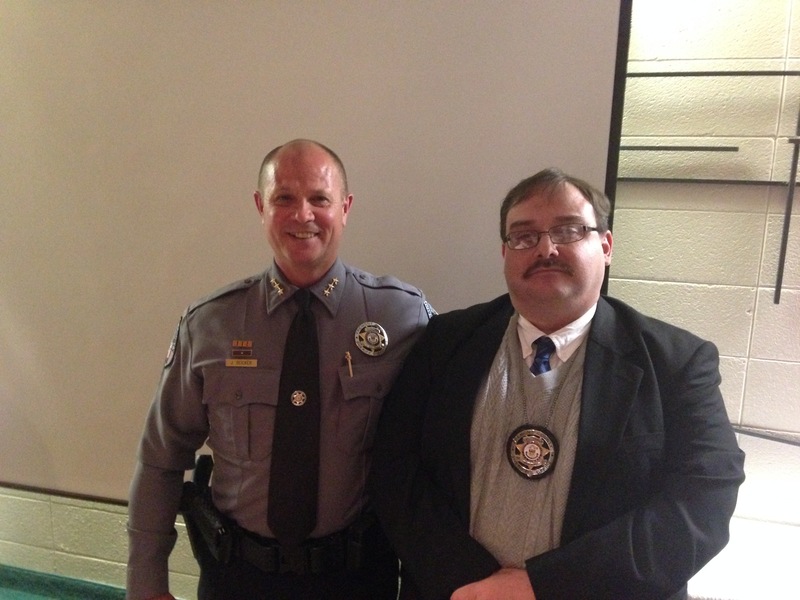 Fremont County Sheriff Jim Beicker and Undersheriff Ty Martin spent an evening noting the accomplishments of deputies, employees, and supporters at a May 2nd Awards Ceremony at the Holy Cross Abbey. Sheriff Beicker expressed appreciation for the work that patrol deputies, detention officers, and investigators perform to assure public safety for the citizens of Fremont County. 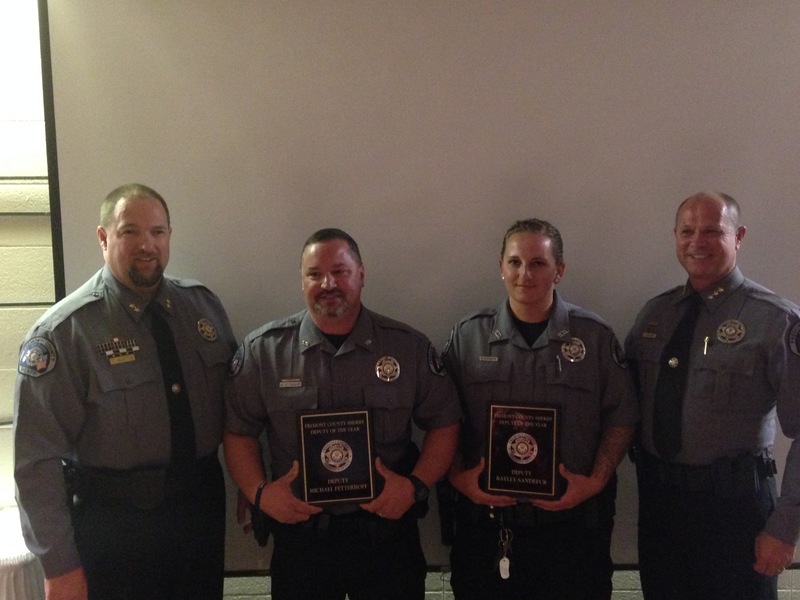 Among highlights of the commendations at the program Deputy Bailey Sandefur was honored as the Detention Deputy of the Year and Deputy Michael Fetterhoff was honored as the Patrol Deputy of the Year. Sheriff Beicker said those awards were voted upon by the officers' peers in the department. Medals of Merit were presented to Deputy William Ownbey, Lieutenant Brent Parker, and Deputy Peter Rasmussen. Life Saving Medals were awarded to Deputies Jeremy Amendola, Mike Girten, Clint Wilson, Chris Pape; Sergeants Felix Montoya and Justin Green; and Florence Police Officer Shane Espinoza. 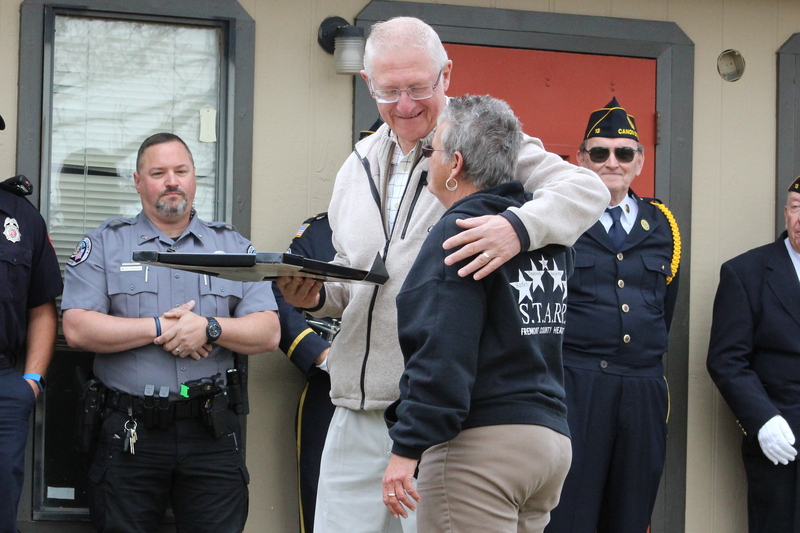 Among many other awards presented during the ceremony Sheriff Beicker gave Special Recognition to the Martin Family at the Gooseberry Patch in Penrose for their support to the department through the years. Sheriff Beicker also singled out Undersheriff Ty Martin for the hundreds of hours the Undersheriff committed to serve as the county’s project manager to coordinate construction and opening of the FreCom joint dispatch center on the 4th floor of the Fremont County Judicial Building. Investigator Robbie Dodd (right) is honored by Sheriff Beicker with a 20 year service award to the Sheriff's Department. Citing a large concentration of medical marijuana businesses in Penrose and impacts upon neighbors next door the Fremont County Commissioner denied a request at their May 10th meeting to expand a medical marijuana cultivation business at the former Bikertown in Penrose. Leif Wagner of Mile High Green Cross had sought a modification to his medical marijuana license to allow for expansion into an existing empty greenhouse in front of the former Bikertown building along Highway 115 as well as building another new greenhouse. The resolution adopted by the Board of Commissioners in denying the expansion listed a number of findings including neighborhood impacts of marijuana odor to a pair of nearby restaurants and the fact that the Penrose area has an unusually high concentration of medical marijuana businesses. Residents have repeatedly complained that more marijuana businesses along Highway 115 have a negative economic impact on their community. The most controversial issue to emerge from the May 10th meeting was consideration by the commissioners to formally go on record in opposition to Amendment 69 on Colorado’s November ballot. Amendment 69 would create a government run, single payer health care system paid for with $25 billion in new taxes. Commission Chairman Ed Norden said he requested the agenda item intending to personally voice opposition to the proposed amendment. Norden said he felt that signing a letter of opposition by the entire board would send an even louder message about how bad the amendment would be for Fremont County and Colorado. Norden noted that the $25 billion collected under Amendment 69 would not be subject to Tabor limits and it would take Colorado from one of the lowest income tax rates in the nation to among the top ten states for income taxes. Norden said the biggest unknown if the amendment were to pass is how many jobs could be lost because businesses would close their doors or avoid doing business in Colorado because of the 10 percent increase in payroll taxes. Upon learning that the commissioners were considering a statement of opposition to Amendment 69, several supporters of the amendment appeared before the board asking them not take a public position or at least delay the matter for more study. Pastor Bob Kippley said if the rate of cost increases for premiums, co-insurance and deductible continues on the same trajectory it has the last 20 years, many individuals and companies will find paying for health care impossible. He said a systemic change is needed because of the suffering that the present health care system is causing the citizens of Fremont County. Doug Smith said that beyond the issues within the amendment itself he believed the board should not take a position on behalf of the citizens of Fremont County and instead simply let the voters decide. District 2 Commissioner Debbie Bell said she doesn’t want to see Colorado be a guinea pig for health care, the way it has for legalizing marijuana. Bell said “Amendment 69 does not give us that freedom of choice, and I am completely against it." Commissioner Tim Payne said it concerns him that voters won't have an opportunity to make decisions once a 21 member board is seated, and if the amendment is written into the Constitution, it takes away the ability of legislators to tweak it if there is an issue. The commissioners voted unanimously to write a letter publicly stating opposition to Amendment 69. Approved a water service agreement with the City of Florence for purchase of a ¾ inch water tap at the Fremont County Airport. The water tap will serve new office space for the Colorado Division of Fire Prevention which will be headquartering at the airport. After listening to more protests from Penrose area residents over impacts of medical marijuana greenhouse operations the Board of Commissioners tabled a decision on whether to permit expansion of a medical marijuana facility next to Highway 115. Leif Wagner of Mile High Green Cross is seeking approval of a Modification to Premises to permit him to expand with another two greenhouses for indoor medical marijuana grows at 685 Colorado Highway 115, the former Bikertown facility. At the April 26th public hearing Wagner told the commissioners that he wanted approval to put up a fence around an existing greenhouse to extend the privileges of his current license. His plan would include operating in an existing greenhouse that is empty and erecting another one next to it. The previous owner of the empty greenhouse told the commissioners the greenhouse would be dismantled, but it was not ordered by the board. Commission Chairman Ed Norden said one of the primary reasons he voted to approve the original license was because the marijuana was being grown inside an enclosed space in the former Bikertown structure. Several Penrose residents echoed similar concerns saying the odor of marijuana can be detected while sitting on the Coyote Coffee Den’s open patio next door. Tami Mundy said one of her biggest concerns is the increase in transient and homeless people in the Penrose area. She also expressed concern that the Mile High Green Cross operation is a stone’s throw away from the Penrose Park which attracts a lot of families and young children. District 2 Commissioner Debbie Bell said Penrose is being forced to bear a lot of the burden of marijuana. Bell said she is discouraged over the fact that the flavor of Penrose is changing and that it’s becoming a mecca for marijuana growers. The commissioners tabled the modification request until their May 10th regular board meeting at which time they plan to detail their findings and render a decision on Wagner’s request. Another public hearing at the April 26th meeting saw the Board of Commissioners approve a zone change for Bill Balhiser’s property along the south side of Grandview Avenue and west of the intersection of Steinmeier and Grandview. Balhiser’s 13 ½ acres were never developed into 28 residential lots as part of the original Canon Creek Ranch development. The commissioners approved a zone change from low density residential to Ag Rural zone district which would allow for some agricultural uses on no more than two lots which will now be created on the property. Adopted a proclamation declaring May as Older Coloradans Month. Fremont County Commissioner Ed Norden shows his appreciation to Fremont County Head Start Director Jo Beth Palmer on April 19th at Head Start Safety Town. Palmer said with Norden leaving office at the end of this year the staff wanted to note his support of Head Start over the years as a board member of the Upper Arkansas Area Council of Governments. Fremont County Head Start staff members honored two individuals at this year’s annual Head Start Safety Town. The Head Start center in Brookside hosted their 41st annual Safety Town USA which is designed to deliver important safety messages to young children in a fun and entertaining way. Head Start administrators dedicated the 2016 Safety Town to Gregg Goodland, Fire Prevention Technician with the US Forest Service Office in Cañon City. Goodland has come to be affectionately known by all the kids at Safety Town as “Ranger Gregg”. Goodland shared a story of having contacted a family one day on a forest service road and the youngster riding in the truck instantly recognized him as Ranger Gregg from Safety Town. Goodland said that contact reinforced for him the value and importance of the Safety Town messages to children. Head Start staff also honored Fremont County Commission Chairman Ed Norden for his long term support of the Head Start program. Head Start Director Jo Beth Palmer said that over his more than five years of service on the Board of Directors of the Upper Arkansas Area Council of Governments Norden has continually supported Head Start staff, administrators, and parents. Norden said he’s attended lots of Safety Town events over the years but his service on the COG Board has allowed him to see firsthand the real value of the services Head Start provides to families in Fremont County throughout the entire school year. Norden added that he has been particularly impressed with the dedication of the Head Start staff and parents.